Popular for nature excursions out of Cardiff, or as a holiday destination in its own right, the Brecon Beacons National Park is packed full of attractions. The dramatic natural scenery is the main drawcard: the spectacular views earned by climbing the many peaks of the Black Mountains will single-handedly justify travel to the region. Pen-y-Fan, the highest peak in southern Wales, is a particular favourite with hikers. For those interested in exploring underground as well as touching the sky, Brecon Beacons also boasts some impressive caves. The National Showcaves Centre for Wales allows visitors to explore the Dan-yr-Ogof Caves as well as a number of cultural attractions. Speaking of cultural attractions, the village of Hay-on-Wye is world-famous for being the home of the Hay Festival of Literature and the Arts, and is paradise for book lovers at any time of year. The town of Brecon is also charming and a popular base for travel in the region, as is Llanelli. Outside of the lovely little villages, the mountainous region is strewn with Iron Age hill forts, Roman roads, Norman castles and ancient standing stones, providing fascinating sightseeing fodder. One of the most popular ruins is the Carreg Cennen Castle. 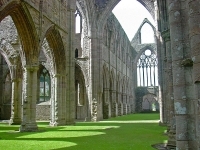 Also in Brecon Beacons, Tintern Abbey is one of the most popular and atmospheric attractions in Wales.